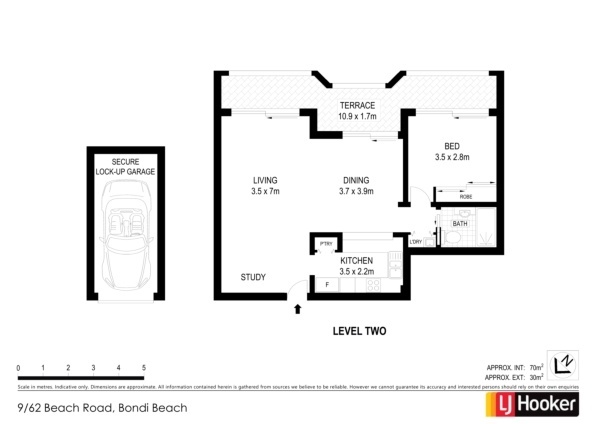 9/62 Beach Road, Bondi NSW 2026 • Local Agency Co. Rarely does a one bedroom apartment this huge come up for sale. This highly desirable apartment boasts an amazing beach lifestyle, light filled, expansive open plan living, huge entertaining terrace, boutique building and lock up garage. Enjoy living in the heart of Bondi & the beach lifestyle, easy walk to the sand, surf, cafes, bars, restaurants and transport. Positioned on the 2nd floor of a newly updated building with only 10 apartments, the ultra-spacious layout will amaze you with a rare sense of space, offering approx 85m2 of living & entertaining. This over-size apartment is the size of many 2 bedrooms in the area! Enjoy relaxing and entertaining on the huge sunny terrace that runs the full length of the apartment with access through large glass sliding doors from the living room, dining area & bedroom.